The deadline has just past for submissions to the annual Online Auction to benefit SAQA (Studio Art Quilt Associates) -- which opens in September. The latest e-bulletin from SAQA's Executive Director, Martha Sielman, is that there are 400 quilts that will be on the auction block! In past years, these quilts have been available for viewing only on the SAQA website, or, generally selectively, on member-contributors' blogs or websites. 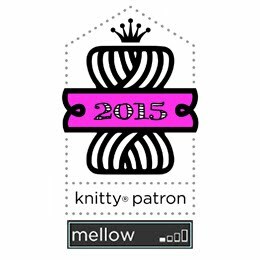 This year, Pinterest has entered the picture. That said, it is a great venue for these pieces because there are so many of them. If you visit the SAQA Pinterest "board" HERE, you will see that each piece has been identified with its title and its maker (see photo below). If you click on the photo, it will enlarge. There's an opportunity to 'like' each given piece and to post a comment. And yes...to 're-pin' it. So. It's a mixed blessing. I'm flattered that some viewers liked my work enough to 'pin' an image of it to their collection. At the same time, I want to trust that those who've 're-pinned' my piece are perhaps SAQA colleagues and friends, or friends from other parts of my life, or at least folks with enough integrity to credit the source. I want to trust that I won't find a facsimile of my piece floating around in cyber-space, credited to some other creator. I've decided to be positive and upbeat about the whole thing and view it as an opportunity to share my work with a wider audience and moreover, to share it for the benefit of the terrific arts organization of which I am a member. 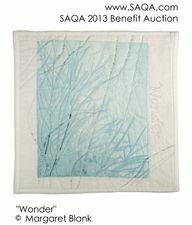 And if you'd rather visit the Benefit Auction 2013 quilts on the SAQA site rather than via Pinterest, you can do so HERE. Enjoy! Make note of your favourites -- and come back online for the Auction, starting Monday, September 9 at 2:00 p.m. Eastern Daylight Time. Hi Margaret, if you click on your little quilt picture , maybe double click, the picture will have a list of the peope who have pinned and/ or liked your work. You do not need to have an account. Check it out! I always hope there will be no copyright infringement too. I LOVE your auction piece! It is beautiful! And thank you for the heads up on Pinterest. Up until now I've had no interest in it but found pictures that were taken from my blog there. Hi Margaret! Regarding Pinterest, I stumbled on to a way to see who is pinning my work lately...just go onto the 'stats' page of your blog...click on 'audience' and if you see Pinterest listed there you can tell who has recently pinned an image. It is immensely flattering! Oooo sorry, I meant go to 'traffic sources' under stats .....if Pinterest is there, click on that and you can see who pinned your work. It has to be recently tho.